From data warehousing to Service Oriented Architecture (SOA), application consolidation and master data management (MDM), enterprise leaders are well aware of the power of information to streamline processes, reduce costs and make businesses more efficient. To succeed, however, these projects must have steady and reliable delivery of timely business information from across the enterprise, which can be both expensive and resource-intensive. Change data capture (CDC) technology helps businesses overcome this challenge by capturing only changed operational data and transmitting it across the enterprise, instead of capturing and transmitting all operational data. This provides substantial business value while helping to reduce risk. This technology drives cost efficiency and improved speed; thereby enhancing traditional ETL processes. 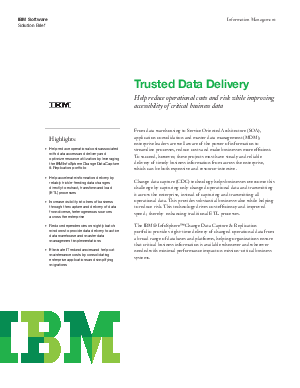 The IBM® InfoSphereTChange Data Capture & Replication portfolio provides right-time delivery of changed operational data from a broad range of databases and platforms, helping organizations ensure that critical business information is available whenever and wherever needed with minimal performance impact on mission-critical business systems.